Paramount Pictures has released a brand new poster for their upcoming and first-ever Transformers spinoff Bumblebee. Directed by Travis Knight (Kubo and the Two Strings), the movie follows an on the run Bumblebee in the year 1987 in a small beach town in California. 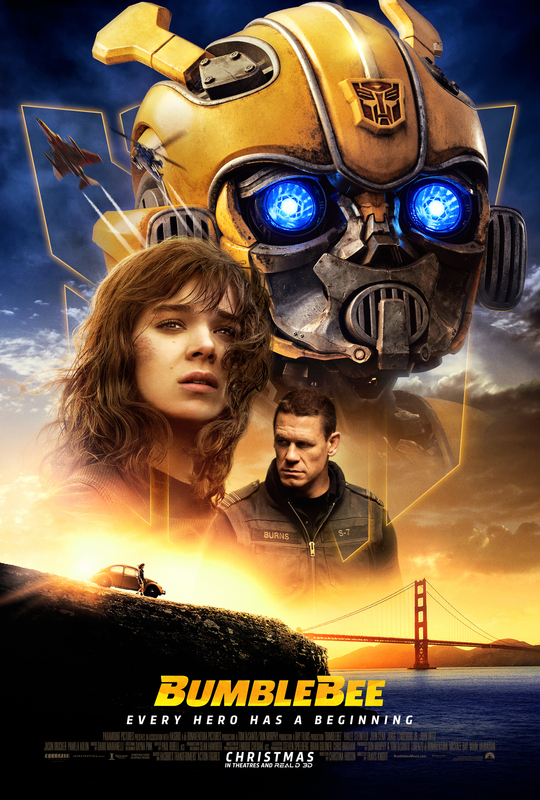 Charlie (Hailee Steinfeld), who is trying to find her place in the world as she turns the corner towards 18, discovers and revives a war-hardened Bumblebee, quickly learning he isn’t just the everyday transforming yellow VW bug. While many claim the trailer gives off the same ridiculous vibe previous Transformers have boasted, there are many things that say otherwise. First of all, Michael Bay isn’t involved with the project. For the first time in the series’ history, someone other than Bay will be directing. That duty falls in the lap of LAIKA President and CEO Travis Knight, who will be making his live-action debut with this film. Secondly and probably most importantly, the project has an enormously smaller budget compared to other in the franchise. That, obviously, isn’t a guarantee that the movie will be a hit or more story / character driven, but it no doubt means that that’s what they are aiming to capture. And yes, that means that there is a less likely chance of outrageously pointless explosions and advertising throughout the movie that almost all the previous movies featured. It’ll be very interesting to see how the film is received. The studio and filmmaker have promised and said that the movie has been made as a “throwback” to older Amblin projects, which is definitely promising for a possible change in direction for these movies. With that said, that could result in a much different kind of box-office haul. These movies have pretty much been critic-proof to this point, but Bay’s Transformers: The Last Knight made the lowest of the bunch so far. Could audiences finally be yawning at giant fighting alien robots? Hopefully not as Bumblebee aims to change everyones mind. What are your feelings on Bumblebee? Have trailers and footage excited you? Does it look like the same old Transformers movies we’ve seen? Also starring John Cena, John Ortiz and featuring voices like Angela Bassett and Justin Theroux as new Transformers, Bumblebee is released in theaters on December 21st.